Just a quickie (as they say) because I want to tell you about this soap. It’s a soap that’s not a soap, more like a creamy cleanser bar. I really like it – and I’m not at all keen on things in bars. 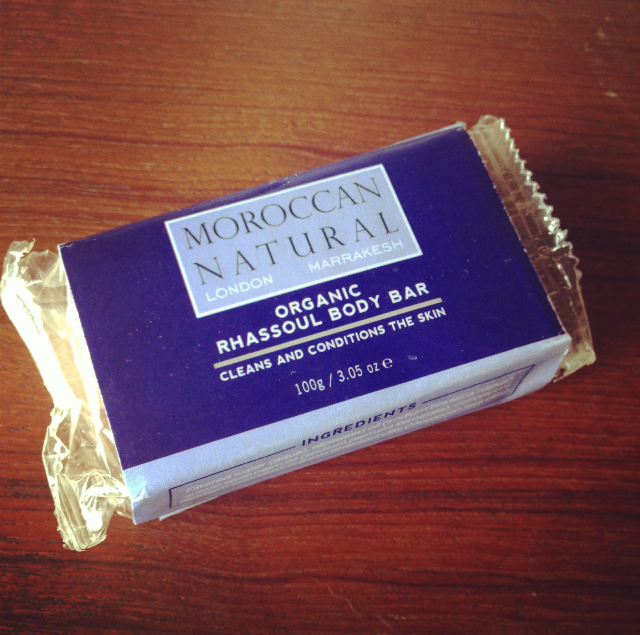 I think that half the reason I like it is that I like the brand – I’ve mentioned Moroccan Natural before – ethical, properly organic and very conscientious when they come to sourcing ingredients. This body bar is a very traditional product – it’s not moisturising in the way that an oil would be, but it doesn’t even have a trace of that tight, squeaky feeling that you can get with soaps. I’m quite interested in Moroccan beauty exports – when I stayed there in January for a shoot, there was a selection of locally produced product in the bathroom and it was all pretty incredible. Unfortunately, I had an accident with the shower and a blocked drain, so there was nothing to bring home or even photograph, but I can tell you that my interest was definitely tickled.